The global burden of sickle cell disease (SCD) is highest in Sub-Saharan Africa, especially in Nigeria where more than 150,000 children are born with the disease annually and about 4 million people are afflicted with the condition.,, Homozygous SCD, sickle cell anemia (SCA), is the most common autosomal recessively inherited genetic disease and affects about 2% of Nigerians at birth. The protean clinical features of SCD result from vaso-occlusion, chronic intravascular hemolysis, microvascular ischemia, and organ damage. The management of SCD continues to be supportive and includes hydration, pain relief, blood transfusion, and psychological support. Complications have been reported in virtually every tissue of the human body, no organ is exempted from its sequelae, and the ears, nose, and throat (ENT) are also affected. In the ears, ischemia of the stria vascularis due to vaso-occlusion in cochlea has been reported. The prevalence of sensorineural hearing loss (SNHL) in older children and adults ranges from 11% to 41%., SNHL occurs in 8% of SCA children in Nigeria, 12% in the USA, 22% in Jamaica, 36.5% in Kenya, and 60% in Ghana. In the nose, priapism of the turbinates causes nasal obstruction and extramedullary hematopoiesis in the paranasal sinuses has been documented in some cases. Adenotonsillar hypertrophy (ATH) in SCD is increased and likely represents compensatory lymphoid tissue enlargement, rather than infection. Wali et al. reported a cerebrovascular incident in a patient with SCD with severe obstructive sleep apnea syndrome (OSAS) due to adenotonsillar enlargement. Sidman and Fry reported complete remission of frequent vaso-occlusive crisis, due to OSAS, in a 12-year-oldollowing tonsillectomy and adenoidectomy. There is a high prevalence (55%) of obstructive ATH in children and adolescents with SCD, while the prevalence of obstructive palatine tonsil hypertrophy is 19%. In children and adolescents, the prevalence of palatine tonsil hypertrophy leading to upper airway obstruction has been reported to be 12%, whereas the prevalence of adenoid hypertrophy is 34%. In patients with SCD, ATH may be due to compensatory ATH secondary to autosplenectomy, recurrent upper airway infections due to decreased opsonization of pathogenic bacteria, and the adenoids and palatine tonsils functioning as hematopoietic centers due to increased hemolysis., Tonsillectomy and adenoidectomy have been associated with complete remission of frequent vaso-occlusive crisis due to obstructive sleep apnea. In Nigeria, in 2006, more than 98% of patients with SCA are not treated with hydroxycarbamide which is the current therapy for recurrent vaso-occlusive episodes. Recent studies by Suleiman et al. showed an increased usage of hydroxyurea of 18% among the patients with SCD in Zaria while the knowledge of this drug by patients increased from 1.9% in 2006 to 20.2% in 2016. However, complications of the disease are seen in almost all organs. Earlier studies have reported a 25% prevalence of pulmonary arterial hypertension among patients with SCD in Nigeria, 55.4% of autosplenectomy, and 28.4% with cholelithiasis and derangements of mild liver function tests even in the steady state. This is because the vast majority of patients with SCD in Africa and in Nigeria have limited access to adequate health care, including pure tone audiometry (PTA) for the diagnosis of HL. In addition, there is a lack of skilled personnel, especially ENT specialists to conduct and complete such studies. It would therefore be helpful to have an anatomical and functional assessment of the ENT to serve as a baseline that would identify high-risk pediatric patients in our setting who should be considered for interventions to reduce morbidity and mortality. This present analysis was thus aimed to examine and determine the prevalence of anatomic changes and dysfunction of the ENT among pediatric patients with SCD in a resource-limited setting, Nguru, Nigeria. This was a cross-sectional prospective study carried out among pediatric patients with the diagnosis of SCD at the Federal Medical Centre (FMC), Nguru, Yobe State. The institutional ethical and scientific approval was obtained in accordance with the Declaration of Helsinki as well as assent/consent from the parents and care givers. The research participants were children aged 1 year above of both genders and patients were recruited consecutively in January and February 2018 from the emergency pediatric units and outpatient clinics, but community and regional referrals were also accepted. Exclusion criteria included parents unable to understand the investigational nature of the study or to give informed consent/assent. Nguru town is an ancient town in North-Eastern Nigeria, made popular by being a terminus of the old Nigerian rail line accounting for a lot of commercial activities and multiethnic diversities. It is located near the Hadejia river at longitude 12o 52N and latitude 10o 27'09E, with a land area of 916 km2 and a population of 150,632 at the 2006 census figures. The FMC Nguru is a 400-bed tertiary hospital and one of the federal tertiary hospitals located in Yobe State, caters for patients from all the senatorial districts in Yobe State as well as the neighboring states of Kano, Jigawa, Borno, Bauchi, and Gombe, including across the border from Niger. Sociodemographic characteristics, history of SCD, and management received were obtained by administration of a structured questionnaire. Hematological parameters, hematocrit, white cell count, and reticulocyte counts were determined by standard manual methods adopted from Dacie and Lewis. Hemoglobin (Hb) phenotype was determined by alkaline electrophoresis at a pH of 8.6. On electrophoresis, all patients with SCD showed no HbA (but showed elevated levels of HbS alone or in association with HbC), consistent with HbSS or HbSC phenotype. Patients with electrophoretic documentation of Hb A or AS phenotype were excluded. Otologic, laryngological examinations and audiometric tests were performed. “Habitual/excessive snoring” in the study referred to noisy breathing during sleep which is severe enough to affect quality of patient's sleep. “Recurrent ear discharge” referred to episodes of ear discharge occurring for >12 weeks. “Recurrent sore throat” referred to episodes of sore throat severe enough to require medications and loss of school attendance, occurring 5–6 times in a year. Diagnostic PTA was performed in a soundproof booth with ambient noise of <45 dB using a calibrated 2 channel diagnostic audiometer (MA 53, Maico Inc.,) by the same audiologist on all the patients. Air conduction thresholds were measured at the frequencies of 250, 500, 1000, 2000, 4000, 6000, and 8000 Hz, while the bone conduction thresholds were measured at the frequencies of 250, 500, 1000, 2000, and 4000 Hz for each ear separately. The method used was based on the American Speech Hearing Association guidelines for manual PTA. HL was categorized as conductive where air-bone gap was ≥15 dB, while SNHL occurred where significant hearing handicap occurred without any air-bone gap. Normal hearing is in the range of 10–25 dB HL, while hearing impairments were classified into five categories: mild (26–40 dB HL), moderate (41–55 dB HL), moderately severe (56–70 dB HL), severe (71–90 dB HL), and profound (≥91 dB HL and above). Palatine or adenotonsillar size was graded according to the Brodsky's criteria. All statistical analyses were performed using SPSS for Windows, version 18 (SPSS Inc., Chicago, IL, USA). The results were presented in simple charts, tables, means, and standard; Pearson's correlations were conducted as appropriate and the level of significance was set at P ≤ 0.05. A total of 52 pediatric participants were analyzed during the study. The age ranged from 1 to 15 years with a mean age of 8.81 ± 4.58 years and a female preponderance (male: female ratio, 1.00:1.08) [Table 1]. The lower socioeconomic class (SEC) constituted about half of the SCD participants (51.6%) while the middle and high SEC were 30.8% and 17.3%, respectively, based on Udai Pareek' socioeconomic status scale for rural population. The most common population studied was the Hausa tribe with 44.2% (23/52) while the Kanuri tribe was 28.8% (15/52) and others (Yoruba, Igbo, and Nupe tribes) with 26.9%. The majority of the participants were HbSS (96.2%, 50/52) while only 3.8% (2/52) were double heterozygote's HbSC. Only 2 (3.8%) participants used the combination of folic acid, Paludrine, and hydroxycarbamide as a form of treatment [Table 1]. The majority of the participants (94.2%, 49/52) were on folic acid and Paludrine as the means of supportive treatment [Table 1]. The frequency of occurrence of vaso-occlusive crises in the preceding 12 months is also shown in [Table 1]. 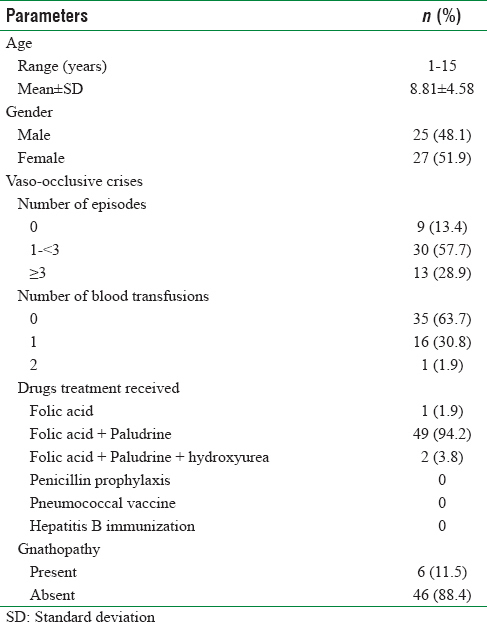 [Table 2] shows the hematological findings for the SCD participants in the study. Clinical characteristics of the ears and nose of the participants are shown in [Table 3]. Otolaryngological findings in the SCD participants are shown in [Table 4]. Excessive snoring was present in 28.8% (15/52) of the participants. Of the 15 participants, the plain radiograph of the postnasal space showed >75% occlusion of the nasopharynx in 60.0% (9/15) of the participants, 50%–75% occlusion in 26.7% (4/15), and <50% occlusion in the remaining 13.3% (2/15). Recurrent ear discharge was present in 21.2% (11/52) of the SCD participants, while PTA findings were normal for the right and left ears in 73.1% and 75.0%, respectively. Conductive HL accounted for 9.6% and 7.7% in the right and left ears, respectively, while SNHL loss accounted for 13.5% and 3.8% in the right and left ears, respectively. The presence of recurrent sore throat was recorded in 17.3% (9/52) of SCD participants, while the tonsil size recorded Brodsky Grade 1 in 73.1% of SCD participants, Grade 2 in 25%, and Grade 3 in 1.9%. The correlation of hematologic, otolaryngological, and clinical characteristics is shown in [Table 5]. In the present study, audiologic findings revealed the existence of both conductive and SNHL, although the majority of the participants had a normal PTA. The prevalence of SNHL in our study is comparable to 13.4% earlier reported in Enugu, Nigeria, and 12% reported in the USA. However, it is lower than the prevalence reported in other parts of Africa (Kenya 36.5% and Ghana 60%) and 21.4% in Brazil. The relationship between SCA and HL has been clearly documented and hearing deficit reported in the literature describes losses of mild-to-profound levels. This study did not reveal unilateral losses; however, a variable loss in both ears, as previously documented in literature, where most of the cases have bilateral HL and unilateral HL, is rarely described.,,, A meta-analysis study carried out on the hearing of individuals with SCD reported that the ischemia of the stria vascularis leads to hypoxia in the organ of Corti, especially in individuals with a large number of repeated vaso-occlusive episodes. 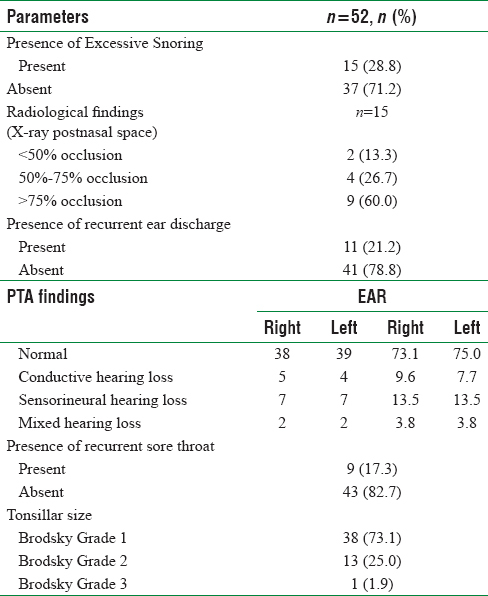 In contrast, our study demonstrated a negative but statistically insignificant correlation between the number of vaso-occlusive episodes and PTA findings in both ears [Table 5]. Some studies have reported that the cochlear lesion is caused by the deformation of the red blood cell, which prevents proper blood supply to the high metabolic activity required to maintain the delicate ionic and electrical balance of the endolymph, and that the anoxia caused to the organ of Corti would cause extensive and progressive cochlear damage, which would justify the lack of otoacoustic emissions in individuals with SCA. In Congo, an African country, a study reported sudden HL in individuals with SCD. There was no report of sudden HL in our study. Hearing deficit occurs as a result of the cochlear high sensitivity to vessel occlusion, causing ischemia and cochlear anoxia, because of the sickle cells which preclude blood flow to the cochlear epithelium. The fact that the cochlea is mainly fed by one single artery, the labyrinthine artery, which can be a terminal artery, makes the inner ear very much prone to circulatory changes. Early diagnosis of hearing impairment has been a constant issue, and often, such impairment is irreversible, affecting not only the oral language but also the child's global development and school performance. Although bacterial cultures were not carried out in our study, the finding of 21.2% ear discharges is an indication that these patients may be susceptible to infections. Bacterial infection is the leading cause of morbidity and mortality in individuals with SCA due to a weakened immune function. Immune suppression may result from splenic dysfunction, autosplenectomy, micronutrient deficiency, abnormalities of the cell mediated immunity and complements. 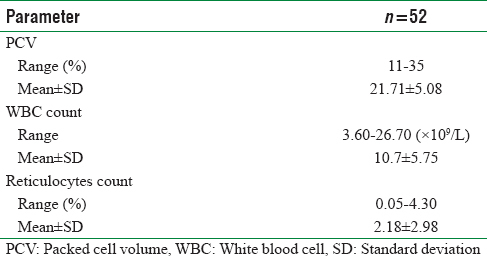 The increased susceptibility to infections may also be associated with the low hematocrit [Table 3] in these patients due to chronic hemolysis., However, there was a negative but statistically insignificant weak correlation of packed cell volume to the number of ear discharges [Table 5]. Expectedly, the white cell count was high, as is being reported in patients with SCD buttressing earlier findings., Leukocytosis may not be a response to infection but triggered by chronic pain resulting in the redistribution of leukocytes between the marginal and circulating pools., Conversely, we obtained a negative but weak and insignificant correlation of the white cell count to the number of ear infections. These negative and insignificant correlations obtained in this study may not be unconnected to the small sample size. Although 28.9% of the participants had experienced ≥ 3 vaso-occlusive episodes in the preceding 12 months [Table 1], only 3.8% were on hydroxycarbamide, supporting the poor utilization of this current therapeutic agent as earlier reported. None of the children in this study had penicillin or pneumococcal vaccine due to unavailability and unaffordability [Table 1]. In Nigeria, like in many Sub Saharan African countries, despite the inclusion of penicillin prophylaxis, pneumococcal and Hepatitis B immunization in childhood vaccinations, they are not routinely given in children with SCD. This is largely due to unavailability of these vaccines in this area. In keeping with the observation of increased susceptibility to infection in these patients, we also observed the presence of recurrent sore throat (pharyngitis) [Table 4]. The reasons are not far-fetched from the above. The excessive snoring or sleep-disordered breathing of 28.8% recorded in this study may be consistent with features of the OSAS in these patients [Table 4]. This can be explained by the occlusion of the nasopharynx, and this is supported by high tonsillar enlargement (73.1% Brodsky Grade 1) observed in 60% of those children that snore. Obstructive sleep-disordered breathing includes a spectrum of clinical entities with variable severity ranging from primary snoring to OSAS. We could not diagnose OSAS (absence of polysomnography) in this study, but the clinical suspicion for OSAS is most often raised by parental report of snoring and upper airway obstruction was reported. The prevalence of OSAS in children with SCA is not well defined, and there is uncertainty whether OSAS is more common in this disorder.,, Excessive snoring observed in this study is consistent with the previously reported prevalence range of 5% to 79%. However, snoring has been reported as a strong risk factor for OSAS in children with SCA. The prevalence of “OSAS” among patients with SCD in our study is lower than 41% reported in sleep and asthma cohort study in the USA, but higher than 8.7% in African-American children and 10.6% in a Brazilian cohort of children with SCA. In this study, the high prevalence of various degrees of tonsillar hypertrophy (98.1%) is similar to 93.1% reported in Ghana. This is consistent with the findings of other studies that the palatine tonsils in SCD are usually enlarged., Although there was a report of cerebrovascular accident in a patient with SCD with severe OSAS due to tonsillar enlargement, in contrast, we obtained a negative and significantly weak correlation of excessive snoring and tonsillar size [Table 5]. The correlation of vaso-occlusive episodes with tonsillar size was negative, but not significant despite previous reports of remission of frequent vaso-occlusive crisis following tonsillectomy. SCD commonly causes ear infections, HLs, snoring, and tonsillar enlargement. Regular otolaryngological examination, audiometric assessment, infection prophylaxis, counseling, follow-up, and appropriate intervention will prevent irreversible complications while reducing morbidity and mortality in these patients. The limitations of the study include small sample size and lack of control participants, absence of automated hematology analyzer, and polysomnography as well as failure to obtain assent/consent for inclusion of children with normal Hb phenotype (HbAA) as control for the study. Further studies with a larger sample size, a longitudinal study and the inclusion of a control group is strongly suggested. We thank the following individuals and laboratory scientists: Abdullahi Usman, Fantami Alhaji Ali, Anita Uzoma and Hadiza Bashir and ENT Nurses Mallam Musa and Mallam Umar Nuhu for their roles in patient enrollment, phlebotomy, laboratory analysis, and audiological tests. Anie KA, Egunjobi FE, Akinyanju OO. Psychosocial impact of sickle cell disorder: perspectives from a Nigerian setting. Globalization and health 2010;6:2. Wali YA, Okbi HA, Abri RA. A comparison of two transfusion regimens in the perioperative management of children with sickle cell disease undergoing adenotonsillectomy, Pediatr. Hematol. Oncol., 2003; 20:7-13. Koussi A, Zafeiriou DI, Kontzoglou G, Tsatra I, Noussios G, Athanassiou M, et al. Hearing loss in children with sickle cell disease. Acta Otorhinolaryngol Belg 2001;55:235-9. Mgbor N, Emodi I. Sensorineural hearing loss in Nigerian children with sickle cell disease. Int J Pediatr Otorhinolaryngol 2004;68:1413-6. James D. Sidman, Terry L. Fry. Exacerbation of Sickle Cell disease by Obstructive Sleep Apnea. Arch Otolaryngol Head Neck Surg 1988;114:916-7. Sidman JD, Fry TL. Exacerbation of sickle cell disease by obstructive sleep apnea. Arch Otolaryngol Head Neck Surg 1988;114:916-7. Salles C, Ramos RT, Daltro C, Nascimento VM, Matos MA. Association between adenotonsillar hypertrophy, tonsillitis and painful crises in sickle cell disease. J Pediatr (Rio J) 2009;85:249-53. Kara CO, Ergin H, Koçak G, Kiliç I, Yurdakul M. Prevalence of tonsillar hypertrophy and associated oropharyngeal symptoms in primary school children in Denizli, Turkey. Int J Pediatr Otorhinolaryngol 2002;66:175-9. Maddern BR, Reed HT, Ohene-Frempong K, Beckerman RC. Obstructive sleep apnea syndrome in sickle cell disease. Ann Otol Rhinol Laryngol 1989;98:174-8. Aliyu ZY, Babadoko A, Mamman M. Hydroxyurea utilization in Nigeria; lesson in public health. Blood (ASH Annual Meeting Abstracts) 207;110:80. Suleiman AM, Aminu SM, Hassan A, Ibrahim IN, Babadoko AA, Kusfa IU, et al. Knowledge and utilization of hydroxyurea among patients with sickle cell disease in Zaria, Nigeria: A comparative study. Niger J Haematol 2018;1:25-9. Aliyu ZY, Gordeuk V, Sachdev V, Babadoko A, Mamman AI, Akpanpe P, et al. Prevalence and risk factors for pulmonary artery systolic hypertension among sickle cell disease patients in Nigeria. Am J Hematol 2008;83:485-90. Babadoko AA, Ibinaye PO, Hassan A, Yusuf R, Ijei IP, Aiyekomogbon J, et al. Autosplenectomy of sickle cell disease in Zaria, Nigeria: An ultrasonographic assessment. Oman Med J 2012;27:121-3. Hassan A, Yusuf R, Babadoko AA, Ibinaiye PO, Aminu SM, Muktar HM. An evaluation of the gallbladder in adult sickle cell anemia patients in Zaria North-West Nigeria. Arch Int Surg 2015;5:25-8. Akuyam SA, Abubakar A, Lawal N, Yusuf R, Aminu SM, Hassan A, et al. Assessment of biochemical liver function tests in relation to age among steady state sickle cell anemia patients. Niger J Clin Pract 2017;20:1428-33. Bain BJ, Bates I, Laffan MA, Lewis SM. Basic haematologic techniques. In: Lewis SM, Bain BJ, Bates I, editors. Dacie and Lewis Practical Haematology. 11th ed. London: Churchill Livingston; 2012; p. 23-56. National Institute on Deafness and other Communication Disorders (NIDCD). Hearing Aids. Available from: http://www.nidcd.nih.gov. [Last accessed on 2018 Jan 10]. Gell FM, White EM, Newell K, Mackenzie I, Smith A, Thompson S, et al. Practical screening priorities for hearing impairment among children in developing countries. Bull World Health Organ 1992;70:645-55. Olusanya BO, Neumann KJ, Saunders JE. The global burden of disabling hearing impairment: A call to action. Bull World Health Organ 2014;92:367-73. Brodsky L. Modern assessment of tonsils and adenoids. Pediatr Clin North Am 1989;36:1551-69. Singh T, Sharma S, Nagesh S. Socio-economic status scale updated for 2017. Int J Res Med Sci 2017;5:3264-7. Silva LP, Nova CV, Lucena R. Sickle cell anemia and hearing loss among children and youngsters: Literature review. Braz J Otorhinolaryngol 2012;78:126-31. Onakoya PA, Nwaorgu OG, Shokunbi WA. Sensorineural hearing loss in adults with sickle cell anaemia. Afr J Med Med Sci 2002;31:21-4. Diggs LW. The crisis in sickle cell anemia; hematologic studies. Am J Clin Pathol 1956;26:1109-18. Miller JM, Dengerink H. Control of inner ear blood flow. Am J Otolaryngol 1988;9:302-16. Burch-Sims GP, Matlock VR. Hearing loss and auditory function in sickle cell disease. J Commun Disord 2005;38:321-9. Leikin SL, Gallagher D, Kinney TR, Sloane D, Klug P, Rida W, et al. Mortality in children and adolescents with sickle cell disease. Cooperative study of sickle cell disease. Pediatrics 1989;84:500-8. Salawu L, Orimolade EA, Durosinmi MA. Immuno-haematological characteristics of Nigeria sickle cell diseases patients in asymptomatic steady state. Eur J Gen Med 2009;6:170-4. Akinbami A, Dosunmu A, Adediran A, Oshinaike O, Adebola P, Arogundade O, et al. Haematological values in homozygous sickle cell disease in steady state and haemoglobin phenotypes AA controls in Lagos, Nigeria. BMC Res Notes 2012;5:396. Joosten KF, Larramona H, Miano S, Van Waardenburg D, Kaditis AG, Vandenbussche N, et al. How do we recognize the child with OSAS? Pediatr Pulmonol 2017;52:260-71. Wise MS, Nichols CD, Grigg-Damberger MM, Marcus CL, Witmans MB, Kirk VG, et al. Executive summary of respiratory indications for polysomnography in children: An evidence-based review. Sleep 2011;34:389-98AW. Rosen CL, Debaun MR, Strunk RC, Redline S, Seicean S, Craven DI, et al. Obstructive sleep apnea and sickle cell anemia. Pediatrics 2014;134:273-81. Rosen CL, Larkin EK, Kirchner HL, Emancipator JL, Bivins SF, Surovec SA, et al. Prevalence and risk factors for sleep-disordered breathing in 8- to 11-year-old children: Association with race and prematurity. J Pediatr 2003;142:383-9. Salles C, Ramos RT, Daltro C, Barral A, Marinho JM, Matos MA, et al. Prevalence of obstructive sleep apnea in children and adolescents with sickle cell anemia. J Bras Pneumol 2009;35:1075-83. Opoku-Buabeng J, Akoto A. Hypertrophic tonsils in sickle cell patients in Ghana. J West Afr Coll Surg 2012;2:1-11.